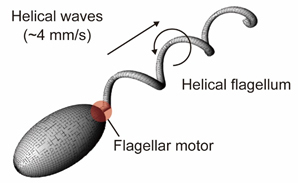 Fig.1 Flagellar propulsion by helical waves. Fig.2 The helical flagellum models used for this study. Fig.3 Experimental setups for (a) thrust measurement and (b) PIV measurement. Fig.4 Thrust per unit filament length vs. tangential velocity. 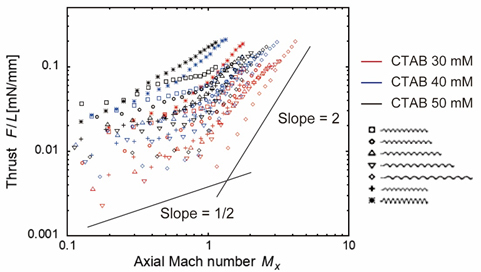 Fig.5 Thrust per unit filament length vs. axial Mach number. Fig.6 The axial component of fluid velocity generated by a rotating helical model (Model-E, 30mM). (1) Tajima, K., and Mikami, F., Effect of viscoelastic Mach numbers on propulsive forces of a model helical flagellum in a viscoelastic fluid, TFEC9 (Okinawa, Japan), Extended Abstracts, (2017), TFEC9-1077. (2) Brennen, C., and Winet, H., Fluid mechanics of propulsion by cilia and flagella, Annual Review of Fluid Mechanics, (1997), pp.354-370. (3) Lighthill, J., Flagellar hydrodynamics, SIAM review, 18(2), (1976), pp.161-230. (4) Celli, J. P., et al., Helicobacter pylori moves through mucus by reducing mucin viscoelasticity, Proceedings of the National Academy of Sciences, 106(34), (2009), pp.14321-14326. (5) Rodenborn, B., Chen, C., Swinney, H. L., Liu, B., Zhang, H. P., Propulsion of microorganisms by a helical flagellum, Proceedings of the National Academy of Sciences, 110(5), (2013), pp.E338-E347. 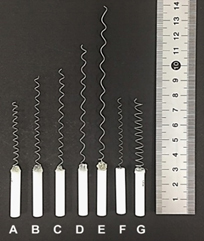 (6) Liu, B., Powers, T. R., Breuer, K. S., Force-free swimming of a model helical flagellum in viscoelastic fluids, Proceedings of the National Academy of Sciences, 108(49), (2011), pp.19516-19520. 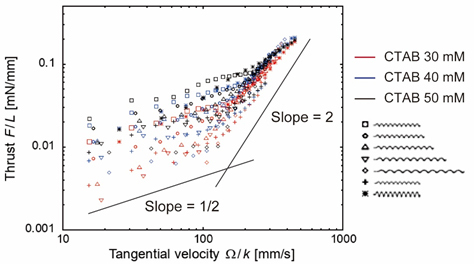 (7) Spagnolie, S. E., Liu, B., Powers, T. R., Locomotion of helical bodies in viscoelastic fluids: Enhanced swimming at large helical amplitudes, Physical Review Letters, 111(6), (2013), pp.1–5. (8) Joseph, D. D., Fluid dynamics of viscoelastic liquids, Springer-Verlag, (1990), pp.164-176. (9) Mikami, F., Yagi, Y., Mach cones in a viscoelastic fluid, ICTAM2016 (Montreal, Canada), Book of Papers, (2016), pp.1272–1273. (10) 田島和哉・三神史彦，”粘弾性を持つ各種流体中における鞭毛螺旋模型の推進力特性”, 第30回バイオエンジニアリング講演会講演論文集, (2017), 1I02.